M.S. in bioengineering and a B.S. in electrical engineering from Rutgers University; also attended the College of Medicine and Dentistry of New Jersey (CMDNJ)/Rutgers Medical School. 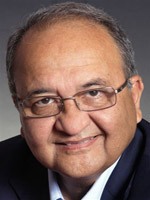 When Mir Imran embarked on his medical device career in 1979, U.S. device industry revenues were around $10 billion, and today annual revenues exceed $120-$130 billion. As the scale of the market has grown, so have technological advances in diagnostics and therapeutics, along with the entrepreneurial spirit to solve many of the world's biggest health problems. Mir exemplifies this spirit, and has been hard at work for more than 30 years developing technologies to address large unmet clinical needs. Mir has founded more than 20 life sciences companies over the years, all based around a common theme: start with major unmet clinical needs and let those needs dictate the solution, rather than develop technology and try to find an application or a market for it. The diagnostic and therapeutic technologies that Mir and his management teams have developed encompass many areas of medicine, including cardiovascular, neurovascular, central nervous system disorders, gastrointestinal, metabolic diseases, pain management, urology, anemia, cancer, drug delivery, patient monitoring, and orthopedics, among others. Mir, who has more than 200 issued patents to his name, personally developed many of these devices, some of them transformative such as the first FDA-approved automatic implantable cardioverter defibrillator (ICD) that is today a standard of care. Another is an endocardial mapping and ablation technology for the treatment of ventricular arrhythmias. In 1995, he founded the research and development (R&D) and business incubator firm InCube Labs to focus on his passion: creating medical solutions that change the standard of care and are, driven entirely by clinical need. And, many of the 20+ companies he has launched have seen "liquidity events" (IPO/ acquisition), as noted in the table at the end of this article. Mir also actively collaborates with the nation's top universities on R&D, including Stanford, Rutgers, Johns Hopkins, University of Texas, University of Pittsburgh and others. Medtech investment is another important area of focus for Mir, and in 2008 he founded the Silicon Valley life sciences venture fund, InCube Ventures. As an active investor, he has led investments in a range of promising ventures focused on opportunities with the potential to dramatically improve patient outcomes. And, with Mir's unwavering entrepreneurial spirit, in May 2013 he co-founded and is Managing Director of VentureHealth, that represents a new twist in equity crowdfunding. This new crowdfunding portal (VentureHealth.com) offers qualified investors access to life sciences deals that traditionally have been reserved for venture capitalists. Mir founded the new venture along with Andrew Farquharson, an investor and entrepreneur with two decades of experience in building, restructuring and acquiring life sciences companies, and Talat Imran, an accomplished entrepreneur in the world of digital media. Life Science Intelligence had the privilege of interviewing Mir this month to find out more about his remarkable career, and catch up on his current projects and his thoughts about today's and tomorrow's device industry and investment climate. Our conversation follows below. Q. What drew you to the device space originally? "When I was an undergraduate in engineering at Rutgers in New Jersey, I took a summer job at the Matheny School for children with cerebral palsy. They were looking for someone to help develop an electronic device to allow a young girl named Jenny, who was a quadriplegic, to communicate with others. I developed a custom device that interfaced with a muscle group that she had voluntary control over, and she was finally able to express herself. It was such a fascinating and rewarding experience, seeing her reaction - she was smiling and crying at the same time - that I turned down the couple thousand dollars they were going to pay me. From that point I knew I wanted to go into the biomedical industry." Q. Tell us a bit about the companies you have founded, and what you feel are your biggest accomplishments. "In medicine it is so difficult to determine whether what you are doing will have an impact, whether it will be a durable therapy or a durable diagnostic. Sometimes solutions come along to replace other solutions. Looking back 30 years, there were several technologies I developed that have lasted over the decades, the first being the implantable cardioverter defibrillator, now a standard of care in cardiology. Subsequent to that I developed an endocardial mapping and ablation technology that is still in use for treating ventricular arrhythmias. More recently, a technology I developed at Spinal Modulation, Inc. for the treatment of chronic pain is rapidly getting adopted in Europe, and is in U.S. clinical trials. This has the potential of being a transformative therapy, and this June, St. Jude Medical made a large ($40 million) investment in Spinal Modulation and has signed an agreement to acquire the company once it reaches certain milestones. We are very excited about that. We also have an exciting therapy for obesity that is approved in Europe (IntraPace), and are advancing the treatment of epilepsy to a new level (Neurolink) with a drug-device combination therapy. The common theme here is that in each case the current therapies for treating these conditions were woefully inadequate, with efficacy rates of well under 50%. We are trying to develop therapies that could dramatically improve patient outcomes." Q. How involved are you with the companies that come out of InCube? "I'm very actively involved, all the way until they're acquired or go public. My role changes: initially I am doing everything – from company strategy to fundraising to product development. Then as more people join the company and a CEO is hired, I take on the role of an active Chairman. In this role I assist the CEO and the management team as a strategic advisor in fund raising, corporate partnerships and in clinical and regulatory strategy, and ultimately in developing an exit strategy. I leverage my network of business relationships to help my companies in a variety of ways." Q. Let's talk a bit about the technologies being developed at your most recent two companies, Theracle and iBridge Medical, their current clinical and regulatory status, and timelines to market. "With iBridge, we are focused on chronic disease management, leveraging wireless technology and a proprietary set of implantable and wearable sensors and unique monitoring strategies focused on providing actionable feedback to patients and care providers. With Theracle, we are focused on the treatment of brain cancer via a unique drug pump that delivers chemotherapeutic agents directly to the brain. This avoids the systemic toxicity of intravenous or oral chemotherapy. These companies were started a few months ago, and are just getting under way. With Theracle, as it is dealing with a terminal cancer, we might have a faster regulatory path in Europe, although we don't know for sure yet. iBridge is developing a platform technology which will likely have greater regulatory and reimbursement complexity as each chronic disease has to be managed differently, and the sensors might be different in each case. We'll roll out one disease application after another. The goal is to create an industry-standard platform for the management of patients with one or more chronic diseases." Q. What do you feel are the main attributes that characterize today's device industry, and how do you feel it is changing or evolving? "The regulatory process was much simpler 30 years ago than it is today. We just have to learn to adapt to that and make sure that we work closely with the FDA in order to get products approved. Also, with the increased regulatory burden, the cost of building companies has probably gone up between 5 to 10 times. A company we could build 30 years ago for $20 million might cost as much as $200 million to build today. A third change I see is in the need for capital. Because the regulatory process can take more than 10 years in some cases, it really makes it a challenge for venture capitalists to invest in these long-interval projects. Most VC funds have a 10-year life, so most investors don't have the patience to wait 10 or 15 years. This has created a shortage of funding, and the 2008 downturn really impacted venture capital in a big way. There are probably half the numbers of life science venture funds now, than prior to 2008, and most of them are not making early-stage investments. In response to the funding challenges, engineers have gravitated a bit toward developing devices that can go through the 510(k) route without clinical trials, but those have their own set of challenges. A number of folks are looking to harness the internet, with information technologies, apps, armbands and other products having to do with consumer self-care. No one has really figured out how to monetize these products, and reimbursement is still a big unknown for these self-care monitoring products. I also feel that we'll be seeing a lot more computation- and Big Data-based solutions, and we’re heading towards integrated electronic medical record capabilities across hospital systems, in say the next five to 10 years. This will lead to a deeper understanding of disease genotype and phenotype and will impact the way we manage and treat chronic diseases. Diagnostics are also getting better, and the promise of personalized medicine is beginning to be realized. Genotyping and phenotyping will also add more interesting perspectives to patient selection for specific therapies. I see a more complex and sophisticated medical device market than what we had in the 70s through 90s, and I think it will serve to improve quality of life and delivery of care. Healthcare costs have been increasing and increasing, but they will stabilize at some point, probably at about 20% of our GDP, right now they're hovering at about 17%. What will make them stabilize is our investment in the next generation of diagnostics and therapeutics, as well as the sophisticated delivery of healthcare to patients." Q. How do you feel the medtech investment climate and venture capital has changed, and what trends do you see? "In the 1980s, a financing round of $10 million was quite uncommon, as companies took so little to develop. Now a $10 million round for a company is viewed as a small financing. The scale of the size of the venture funds has also dramatically increased. Salaries in start-up companies have gone up three- or four-fold, which has contributed to the high cost of building companies. I think that venture capital is now picking up a little bit, and a number of venture companies have successfully raised new funds. Even so, investors are leaning more toward late-stage biotech or late-stage device companies. This gap in early-stage device funding is being filled by corporate investors. For instance, Abbott Ventures, Boston Scientific and a few others are investing in earlier-stage device companies. Another investment phenomenon is crowdfunding, which is a very exciting source of funding. Earlier this year we started an equity crowdfunding company, VentureHealth.com, offering accredited investors access to exciting life science companies. Equity crowdfunding – if approached thoughtfully – can become a very viable source of critical funds for life science companies." Q. How have exit strategies changed, and do you see any changes coming over the next few years? "The IPO market for device companies comes and goes. From time to time, there are brief openings in the IPO market, and I think that we're approaching one now, but they are highly unpredictable. The vast majority of exits are through mergers and acquisitions. One other phenomenon that is happening is that some of the large medtech players such as St. Jude and Boston Scientific are making structured acquisitions. In a structured acquisition the large company, as part of an equity investment, gets a right to acquire the start-up at a predetermined price, if the company being acquired meets specific future milestones. So an early-stage company receives funding, and it can also lead to a lower-cost acquisition for the acquirer." Q. Do you feel there are opportunities in the emerging markets, such as the BRIC countries? "I think South American countries in general and Brazil in particular represent a very interesting opportunity for U.S. medical device companies. India and China are still a challenge, with intellectual property issues, distribution challenges and price pressures. If you're developing cutting-edge technologies, it's better to mature them in the U.S. and in Western Europe, before you take them to Russia, Eastern Europe, China, India and other countries." Q. What do you think are the main headwinds this market faces, both today and looking out over the next few years? "The headwinds are going to be the regulatory burden, cost of care and access to equity dollars. Existing product categories are constantly under price pressures. And new products must demonstrate through well-designed trials not only safety and efficacy, but also economic viability in order to receive approval from CMS and third party payers. The regulatory process will continue to be fairly complex, and the pathway to approval will continue to be a challenge. Finding equity funding has become a greater challenge, given the scarcity of venture capital." Q. Do you see more start-ups trying to enter the market today than you used to years back? "I think there are definitely more start-ups. A number of entrepreneurship programs at universities across the country are training the next generation of entrepreneurs. The Biodesign program at Stanford is a great example. They are churning out talented people who all want to start companies. Entrepreneurial activity is at an all-time high, and along with this, the pace of innovation has increased. I think we need to make sure there is a flow of smart money into these new companies, so that these entrepreneurs can navigate an increasingly complex healthcare environment and bring their innovations to market." Q. What advice would you give to device entrepreneurs just starting out today? "Preparation is important; make sure you have a solid background in multiple disciplines. The key to innovation in my view is in understanding the problem, rather than falling in love with a technology and trying to apply that to every problem you see. There is no substitute for a deep understanding of the underlying clinical problem and the pathology of the disease. You have to understand how it will impact clinical outcomes. These are the questions an entrepreneur should ask before embarking on a new company; everything else takes care of itself. Also, start-ups should really go after the kinds of problems where you can really improve patient outcomes and have a positive effect on patients’ lives. You also must be able to reduce costs. If you are treating these chronic diseases properly, you'll have fewer hospitalizations and an improvement in the quality of life. If you go after small, incremental improvements, the regulatory burden is actually higher as opposed to if you are improving patient outcomes by 100% or 200%. With this type of large improvement, you would need smaller clinical trials to get regulatory approvals." Q. What's next for you, what can we look forward to seeing in 2014? "We're continuing to work on the eight or nine companies that we are building at InCube Labs. And then we have several research projects, addressing a number of clinical needs, some of which might turn into companies.